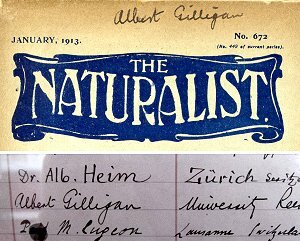 Albert Gilligan was Professor of Geology at Leeds University from 1922 until his retirement in 1939. He is remembered now mainly for his contribution to the understanding of the Yorkshire Millstone Grit. His father was a forge manager in Wolverhampton at the time of Albert's birth and although the family moved to Abertillery, Monmouthshire when he was still an infant, he attended Wolverhampton Grammar School. His father was clearly a talented man and held several patents concerning the production of iron and steel as well as being noted for his remarkable memory. 1874 July 26 : Birth His biograpies and obituaries are consistent as in giving this as his date of birth. Both his parents were Staffordshire born and his father was employed as a forge manager . 1891 April : Tin Plate Worker The census describes Albert's profession as "Catcher in Tin Works". FOOTBALL GOSSIP ... Albert Gilligan, the Abertillery right full back, played a splendid game against Blaina last Saturday, several times gaining well-deserved approbation by his clever defensive work. 1907 : Leeds University Appointed as demonstrator and assistant lecturer in the Geology Department, University of Leeds. 1912 September : Assynt Albert Gilligan was one of the 31 participant in the British Association's excursion to Assynt led by Peach and Horne. Another of the partners was his old tutor from Cardiff University, Prof. W. S. Boulton. The link is to the British Geological Survey web site and provides a photograph of the party at the Inchnadamph Hotel. 1920 : Publication The petrography of the Millstone Grit of Yorkshire. Quarterly Journal of the Geological Society of London 75, 251 - 94. 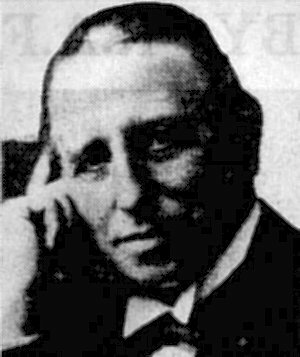 At a meeting of the Council of the University of Leeds, Mr Albert Gilligan, D.Sc., F.G.S., was elected to the Chair of Geology upon the retirement at the end of the present session of Professor P. F. Kendall. We learn fron the Yorkshire Post that Dr. Gilligan is of Irish descent, was educated at Wolverhampton Grammar School and University College, Cardiff, where he held a Monmouthshire County Council scholarship, heading the list of candidates for his year. At Cardiff he specialised in Geology under Professor W. S. Boulton, the present occupant of the Chair of Geology at the University of Birmingham. He also attended courses in geology under the late Professor J. W. Judd at the Royal College of Science. While at University College, Cardiff, Dr. Gilligan took an active part in the athletic and social life of the College, gaining his colours in cricket, football and tennis, and also acting as President of the Students' Representative Council. After graduating in the University of Wales he was for a short time on the staff of the Glossop Technical School before being appointed as demonstrator and assistant lecturer in the Geological Department of Leeds University in 1907. Dr. Gilligans subsequent career is well known to our readers, and we have frequently refered to his work upon the Millstone Grit. In congratulating Dr. Gilligan upon his appointment, we sympathise with him in following a man of the type of Prof. Kendall, whose shoes will take a lot of filling! 1939 October 14 : Death He died while listening to the wireless at New Close, Storth, Milnthorpe, Westmorland. He was recuperating there after breaking a thigh bone in a fall at Whitby, Yorkshire, a few weeks earlier. The linked obituary is taken from the Yorkshire Post.